For conspicuous gallantry and intrepidity above and beyond the call of duty in action with the enemy on August 1, 1943. 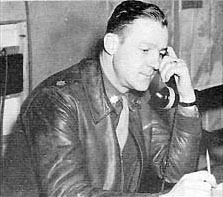 On this date he led his command, the 93d Heavy Bombardment Group, on a daring low-level attack against enemy oil refineries and installations at Ploesti, Rumania. Approaching the target, his aircraft was hit by a large caliber antiaircraft shell, seriously damaged and set on fire. Ignoring the fact he was flying over terrain suitable for safe landing, he refused to jeopardize the mission by breaking up the lead formation and continued unswervingly to lead his group to the target upon which he dropped his bombs with devastating effect. Only then did he leave formation, but his valiant attempts to gain sufficient altitude for the crew to escape by parachute were unavailing and his aircraft crashed in flames after his successful efforts to avoid other planes in formation. By extraordinary flying skill, gallant leadership and intrepidity, Lt. Col. Baker rendered outstanding, distinguished, and valorous service to our Nation. The other nine airmen aboard the Hell's Wench also perished in the crash and Addison's body was never recovered and he was posthumously awarded the Medal of Honor on the 11thof March, 1944. Addison Earl Baker was 36 years old when he died over Romania and his memorial site is in the Florence American Cemetery and Memorial in Florence, Italy.